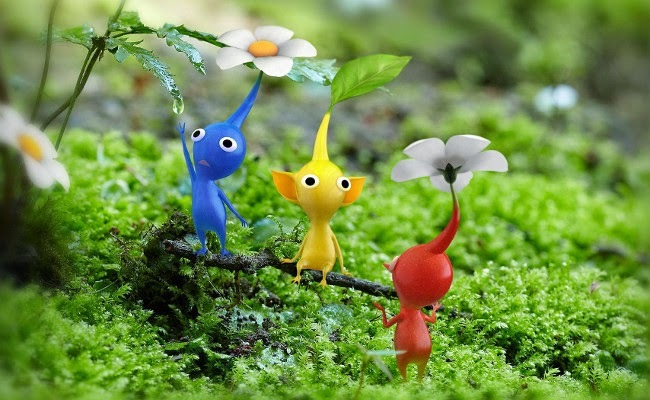 This week on PopMatters, I try to ruin everyone's fun by pointing out that Pikmin 3 can be read as an exploitative colonial metaphor. To be fair, after a rocky start (I still want my C-stick swarm control), I ended up enjoying the game quite a bit. The inclusion of a third controllable character and the combination of Wii Remote pointing and Wii U Gamepad map control made it perhaps the most complex yet satisfying game I've played on the system. You need a lot of hardware, but once you set it up you have a truly unique RTS experience that makes use of the second screen in a meaningful way. Sending your troops to way points while actively controlling other squads was good mental workout, but it never got to the point of becoming busywork. It was actually the concept of having "troops" that stuck out to me. This has always been a latent theme in the Pikmin series, but the daily log entries and overall backstory really stuck out to me. The game sets up a story in which a race of beings who have doomed themselves strike out into space in search of a quick fix. They find this fix, but in the process of doing so essentially create a laboring warrior subclass of indigenous creatures. Jorge and I have both talked about how the procedural rhetoric, the message conveyed by a game's systems, is often more powerful than the explicit authored story. Pikmin 3 is a prime example of this. The game keeps track of the number of Pikmin you've created and the number of Pikmin that have died in your service, but these numbers have no value beyond the utility of having enough Pikmin to complete a job. There is no mechanical penalty or moral judgement for sacrificing these beings. Success is only measured by how much raw material is sent back to the mother country. This cold calculus makes for a satisfying, if slightly horrendous, experience.